Roma Pass - Should you get one? What is the Roma Pass? Is it worth getting one? The pass is a tourist package, offered by the Comune di Roma (the city of Rome), to help visitors get a little bit of a bargain, encourage visits to cultural sites in Rome, and provide them with some useful tools during their visit to Rome. 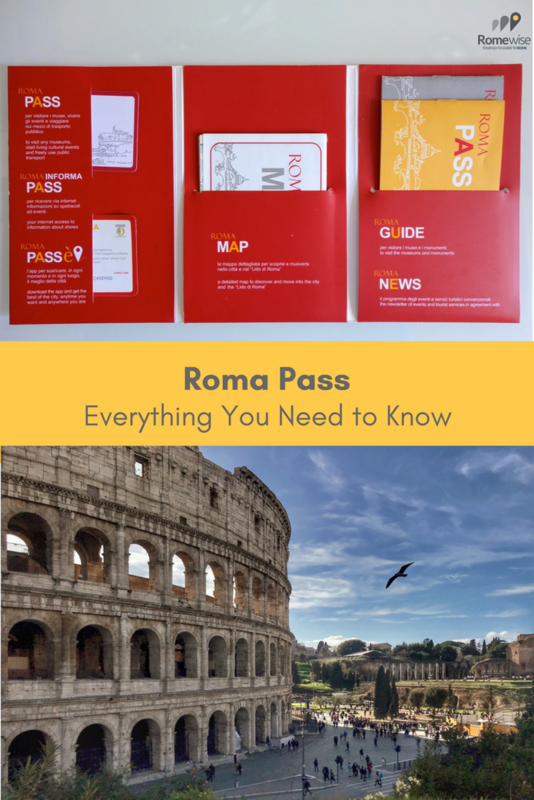 Inside: the Pass, the official Rome City Map, a booklet with list of sites included, and a booklet with current events, exhibits and services that may be included. What is the Roma Pass and what's included? Is the Roma Pass worth getting? What sites and museums can you visit free, and skip the line with the Pass? Do you still need a reservation to the Colosseum if you have a Roma Pass? 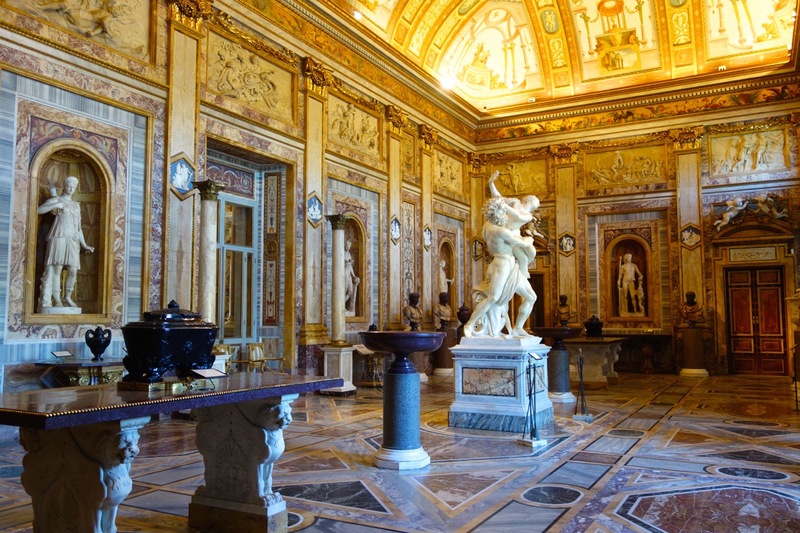 Do you have to reserve the Galleria Borghese if you have the Roma Pass? Can you use the Roma Pass for special night visits to the Colosseum and Roman Forum? Where can you purchase the Roma Pass? Can you purchase it online? Should you get your Roma Pass at the airport when you land? Is the Vatican included in the Roma Pass? What passes do include the Vatican? Are there other city combo passes you can get besides the Roma Pass? Use the Roma Pass to skip the super long lines like this at the Colosseum! Finally, you also get a booklet of any current exhibits or events, or even tourist services, which offer a discount to holders of the pass. The Vatican Museums are not included in the Roma Pass. You may be interested in the Omnia Pass or other Rome Combo Pass, which include the Vatican Museums. Rome Pass - Is it worth getting? The Roma Pass package is good for 3 days from the first date of use. Now you have to decide if you will get the benefits of it during these three days. A typical visit to Rome is about 3 days. In this time, you can see the major plazas and fountains of Rome, Vatican/Vatican Museums, Ancient Rome (Colosseum and Roman Forum) and maybe the Galleria Borghese museum. Since visiting the Vatican and Vatican museums will take up one day of major sight-seeing, that leaves two days to use the pass for other sites in Rome. Most people use the pass to get free entry to the Coliseum and the Galleria Borghese. If you pay for them separately, entry to the Coliseum is 12 Euros and entry to the Borghese museum is 15 Euros (although at times, the Borghese museum entrance fee may be higher if there is a special exhibit.) This comes to 27 Euros. Will you visit at least one other museum or monument in Rome on this list, in the 3 days? They are all discounted with the pass, so if you have a very intense schedule of museum/monument visiting, then you might get your money's worth out of the Roma Pass. In my experience, people seem to want the Roma Pass more than anything else to be able to skip the line. At the Colosseum, there is a separate lane for Roma Pass holders. And that lane has either no line or a much shorter line than the ones for people who show up to buy tickets. When it's high season in Rome, the lines to get in to the two most popular attractions, the Colosseum and the Vatican, can be long. More than an hour's wait sometimes. No fun, especially in the summer heat! Most of the other popular sites in Rome do not have the same kind of queue, and even if there is one, it usually moves pretty quickly. But in any case, with the Roma Pass, you simply skip the line. Sometimes in summer, there is a wait to get into Castel Sant'Angelo, for example, and with the pass, you skip the line. Also, there are other ways to skip the lines. But the Roma Pass makes it easy. The pass costs 38.50€. Remember, you also get, included in the pass, unlimited Metro/bus use. So, will you use nearly 11 Euros of bus/metro rides? A one-way bus/metro ticket costs 1.50€, so you'd need to take at least 7 rides in 3 days for it to be worthwhile for that purpose. If you are staying near Termini station or in Trastevere, or near the Vatican, and need to take the metro to get into the center, or, if you have any walking issues and plan to use public transportation a lot, then maybe you will get this use out of it. If you just want to use the Rome city bus and metro system extensively, consider purchasing a day pass for 7€, a 2-day pass for 12.50€, a 3-day pass for 18€ or a week-long pass for 24€. You may purchase these at almost any tobacco shop or news stand. What museums and archeological sites are included? Most people tend to use the pass to visit the Colosseum and the Galleria Borghese. Perhaps you have already seen these, or don't want to see them. Capitoline Museums - an excellent museum, on Capitoline Hill, just above the Roman Forum, and very much worth a visit if you like the ancient stuff. Castel Sant'Angelo - once Hadrian's mausoleum, later a hiding out place for popes trying to flee when Rome kept getting sacked...a giant fortress with a moat; a prison and execution site, this monument is packed with history, beautiful art, and one of the best views of Rome. Bonus - enjoy a coffee or aperitivo at the rooftop cafe with views of St. Peter's Dome! The Ara Pacis - a gorgeous building of a museum, not far from the Spanish Steps, housing the Altar to Peace, an ancient Roman relic that deserved its own space. There are other finds in this museum as well, but the two best things are the Altar, and the stunning building itself. Palazzo Valentini - one of the most popular archeological sites in Rome lately, these excavations led to finds underneath a noble palazzo. The ruins at Ostia Antica - a 30-minute train ride from Rome, Ostia Antica is a very under-visited, superbly preserved ancient port city. Think Pompeii without the lava or ash. This is not a complete list, but it does include what I know are among the most visited, most popular sites. This is a new rule, as of March 2019. Even holders of the Roma Pass (or any other type of Rome City Pass) have to reserve a date and time at the Colosseum. You can no longer just show up without a timed entry ticket. This is to manage the crowds and the flow, like at the Vatican Museums. However, unlike at the Vatican Museums, there is a limit to how many people can be inside the Colosseum at once (3,000 people is maximum capacity), and, there is therefore a limit to how many tickets will be available each day. So if you do not book your ticket in advance, and just show up at the Colosseum, you risk not being able to get in at the time you want, or possibly not even getting in at all if they run out of tickets. Visit my page about Colosseum tickets for details. DO YOU STILL NEED to reserve the Galleria Borghese IF YOU HAVE A ROMA PASS? The Galleria Borghese is a very popular Rome attraction, but they have a limited number of tickets to sell each day. The Galleria Borghese is one of my favorite things to do in Rome, and it's one of the most popular things to choose to visit for free when you buy the Roma Pass. But you still need to reserve. In very low season, you might be able to just walk up and go in at say 3pm. But you are better off, any time of year, simply booking ahead. For holders of the Roma Pass, this booking is free. You can do it online, or by calling. Visit my page about the Galleria Borghese for details. You can purchase your pass right here on Romewise! Click here to visit TicketBar and purchase your pass online. You can purchase the pass at all the sites and museums that participate in it. You can also purchase it at the various Tourist information points around Rome. There are Rome Tourist Information Points at both Fiumicino and Ciampino airports (in the international arrivals area), and also at Termini and Tiburtina stations. For a full listing of all the Tourist Information Points, a full listing of all the museums and sites included, see the official web site for the Roma Pass. You may also purchase the pass there. Should you purchase the Roma Pass at the airport when you land? If you decide you want one of these passes, one option can be to purchase it once you land. Both Rome airports have a Roma Pass office. You can buy one when you land in Rome. Just know that although the pass is good for use on Rome's buses and the Metro, the train taking you into the center from Fiumicino airport, The Leonardo Express, is not covered by the Roma Pass, so having the pass at the airport doesn't save you any money yet. After a long flight, and fighting crowds, and waiting for luggage, wouldn't it be nicer to just get to your hotel and settle in? I'd recommend either pre-purchasing the pass online, or buying it in town once you are ready to get started sight-seeing. Is it worth getting the Roma Pass? The biggest convenience of the pass is the "VIP Skip the Line" aspect. It's nice to know you can just show up and go right to the front of the line. This is most important at the Colosseum, where lines can be long, particularly in high season. Other advantages include the comprehensive map that's included, and the little booklet with some savings on current exhibits and events. And there is also the peace of mind of knowing you can jump on the bus or metro any time. I live in and walk around Rome alot, but even in the center, I sometimes just feel like hopping on the bus if I'm tired and/or hot. You will visit more than 2 of the museums or monuments on the list in a 3-day period. You will use the bus/metro system more than 7 times in 3 days. You do not plan to visit more than 2 of the museums or monuments on the list in a 3-day period. You are staying in the center and/or otherwise do not plan or need to use public transportation much during your stay. If you have more than 3 days in Rome, and/or otherwise can manage to see more than 2 of the things on their list, in the 3 days, then it's definitely worth getting a the pass, as it will not only encourage you to see more, but also save you some money. The Roma 48 Hours pass is like the Roma Pass but costs 28 Euros, and includes only one site or museum for free. Unlimited use of the city's bus and metro system is also included, as with the standard pass. It might be useful if you only have two days, and/or if you won't include the Borghese Museum. 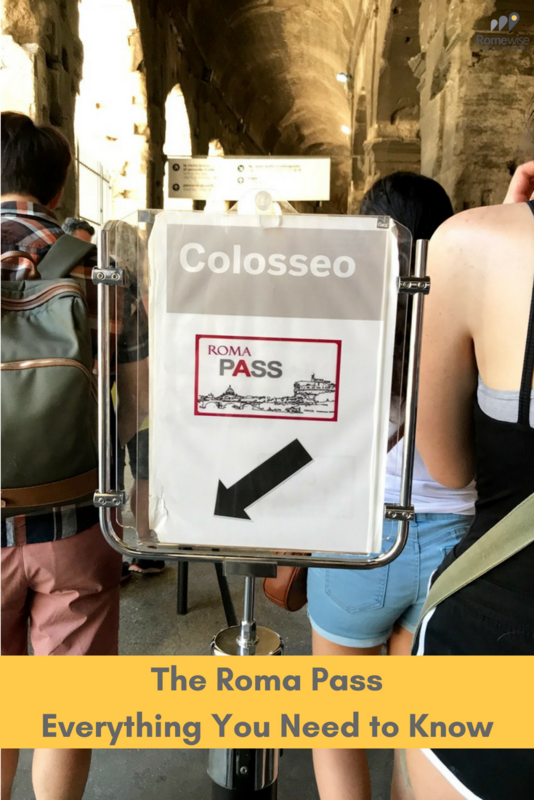 I think the main reason people find the pass useful is to skip the line at the Colosseum, which can definitely be a plus! Click here to buy the Roma Pass 48 hr. The same principles apply as with the 72-hour pass. The skip-the-line aspect is great, but I am not sure it is a big money saver. And the same offers as in the Roma Pass above. With the Omnia Pass, you skip to the front of this insanely long line at St. Peter's Basilica at the Vatican! Is it worth getting the Omnia Pass? Here's the big reason why the Omnia Pass can be worth it - you get to skip the lines for everything including the Vatican Museums and Saint Peter's Basilica. Cost-wise it may not add up as a great savings. At 113€, it's 74.50€ Euros more than the Roma Pass. Tickets to the Vatican museums cost 20 Euros (if you pre-purchase online.) This means you need to get at least another 54.50€ of services to break even. Some audio guides are included in this package, but in my opinion, they are not the best type of guide for the Vatican Museums. Will you have time to ride the Roma Cristiana bus in your 3-day visit? If so, that may be another benefit. Click here to purchase the Omnia Pass and receive your tickets via email! Money-wise, I am not sure these passes are that much of a bargain. They don't save you a lot of money unless you make a plan to really get the most out of them and take advantage of discounts to more than just the first free sites. But the big kicker is the fact that they DO give you a kind of "VIP access", skipping the lines just about everywhere, but especially where you need it most: The Colosseum, Vatican Museums and St. Peter's Basilica. Click here to visit the official web site of the Omnia Pass. You can see all the sites included and find out more details about the pass and how it works. Lines at the Colosseum and Vatican - expect some waiting, even with the pass. No passes that guarantee you skip the line (at the Vatican Museums or the Colosseum) mean there is absolutely no waiting at all. There is always one ticket line for people waiting to buy tickets, and another line for people who already have them (pre-paid/booked, or with these passes). There is also security to get through, for everyone. You may find that during peak season, there is still a line of ticket holders. It will be shorter than the other line but it might be there. As it turns out, there are a few other companies offering Rome combo passes for sight-seeing. It's confusing as to which one offers what, and which could be worth getting. So I made a page comparing all of them here.